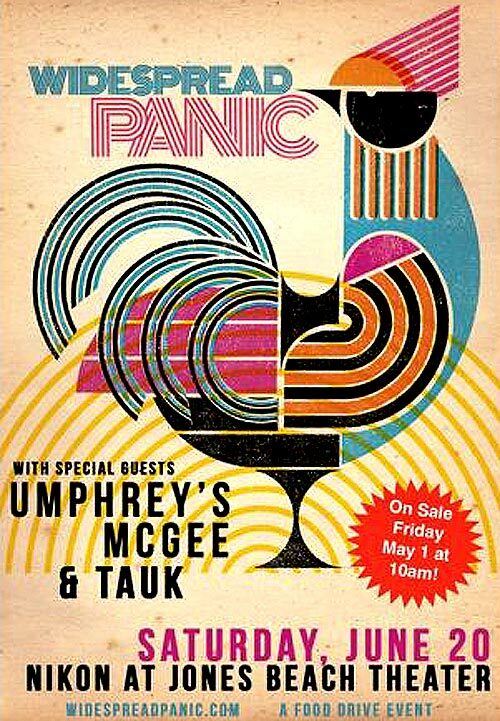 On June 20 Umphrey's McGee and TAUK will open for Widespread Panic at Nikon at Jones Beach Theater in Wantagh, New York. The stop comes in between two previously announced Umphrey's/Panic pairings - June 19 at Stateside Amphitheater in Jay Peak, Vermont & June 21 at Pittsburgh's StageAE. Widespread Panic and Umphrey's McGee have shared a handful of stages in the past. First was at a 2010 show at LC Pavilion in Columbus, Ohio where Umphrey's McGee keyboardist Joel Cummins joined Widespread Panic for "Space Wrangler" and a cover of The Guess Who's "No Sugar Tonight/New Mother Nature." Later in 2010, Widespread Panic guitarist/lead singer John Bell joined Umphrey's McGee for a cover of Bill Withers' "Ain't No Sunshine" at the Warren Haynes Christmas Jam. Then in Charleston on October 5, 2013 Bell again sang "Ain't No Sunshine" with Umphrey's while Cummins and guitarist Jake Cinninger sat-in with Widespread Panic on "Maggot Brain." Cummins and Cinninger stuck around and were joined by percussionist Andy Farag to help out Panic on "Red Hot Mama" before Farag contributed to Widespread's nightly "Drums" sequence. Umphrey's and TAUK will make their Jones Beach debuts in June. The former is expected to perform a 90-minute set in Wantagh. Panic first played the seaside venue during H.O.R.D.E. Tour stops in 1992 and 1993, returned in 1998 as part of the Travelin' Light Tour and last played Jones Beach in 2009 with The Allman Brothers Band. Tonight Widespread Panic begins a two-night stand at Kings Theatre in Brooklyn, New York while Umphrey's McGee continues a three-night visit to Minneapolis' First Avenue and TAUK plays NYC's Midtown Live.